Tuesday July 18 1911 I did some baking today. Rested in afternoon and went down to stay all night. Mother no better. A letter from Lydia telling of Uncle Jacobs last illness. 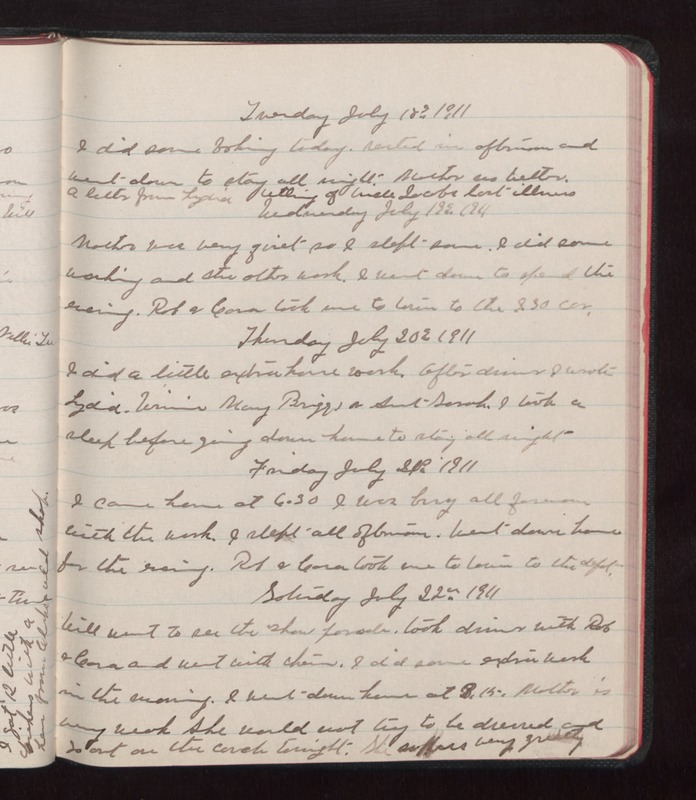 Wednesday July 19 1911 Mother was very quiet so I slept some. I did some washing and the other work. I went down to spend the evening. Rob & Cora took me to town to the 9.30 car. Thursday July 20 1911 I did a little extra house work. After dinner I wrote Lydia. Winnie Mary Briggs & Aunt Sarah. I took a sleep before going down home to stay all night. Friday july 21 1911 I came home at 6.30 I was busy all forenoon with the work. I slept all afternoon. Went down home for the evening. Rob & Cora took me to town to the depot. Saturday July 22 1911 Will went to see the show [illegible]. Took dinner with Rob & Cora and went with them. I did some extra work in the morning. I went down home at 3.15. Mother is very weak She would not try to be dressed and is out on the couch tonight. She suffers very greatly.